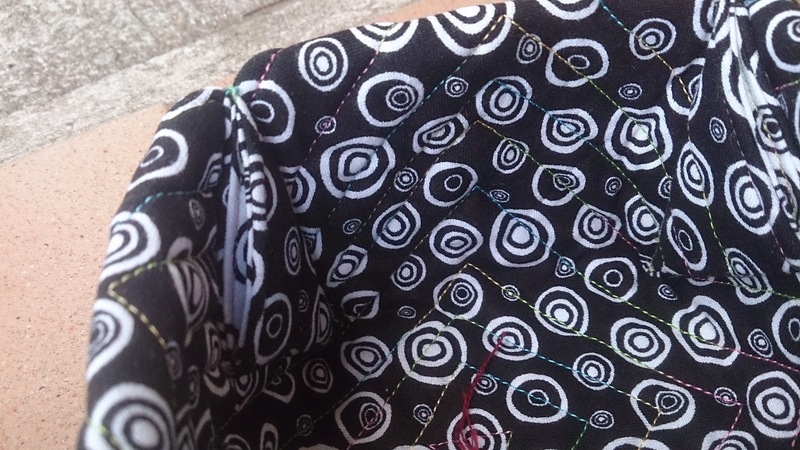 Naughts & Cross stitches: My sewing machine is getting a workout! My sewing machine is getting a workout! I don't know what has gotten into me but since the other day I spent making up the tape measure holder I had he urge to stitch some more. 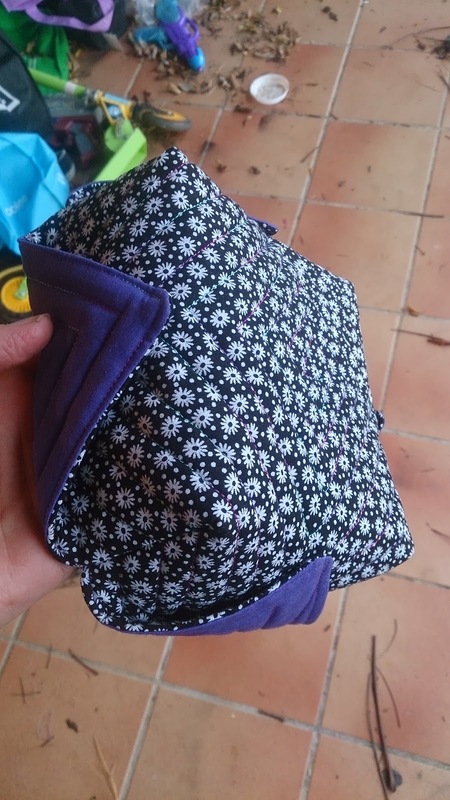 So I was browsing blogs and found a link to a quilted fabric BOX!!!! I just couldn't resist. It's such an easy pattern and as I was reading something came over me. I went from feeling very blah. To going well I have the stash ... 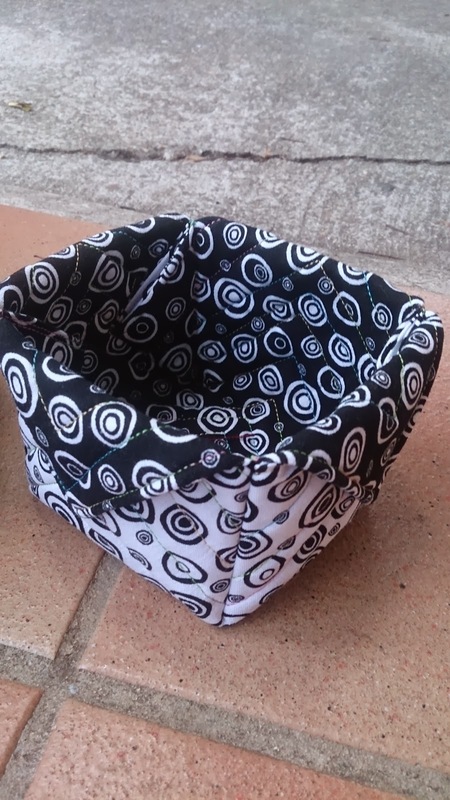 I have all that black and white fabric that I don't have a purpose for anymore but I love using because it makes colours pop... (I need to get a bigger collection of black and white and some plainish colours to go with it.) So out came the sewing machine ... which at the moment is a feat in itself as I don't actually have anywhere to put it it ends up on a stool and I have to almost sit on the floor! My table can't take the weight of the machine. But I am getting distracted. 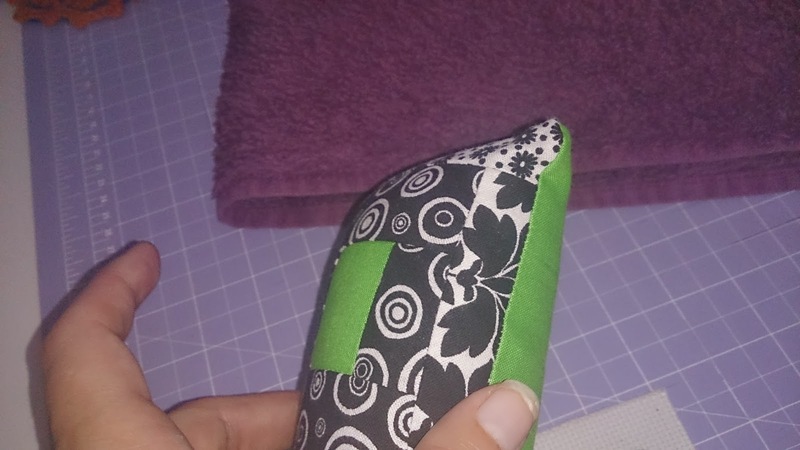 I measure out the fabric and decided to make two at once and did two different sizes. A 12 inch and a 9.5 inch. I was curious how they would turn out. 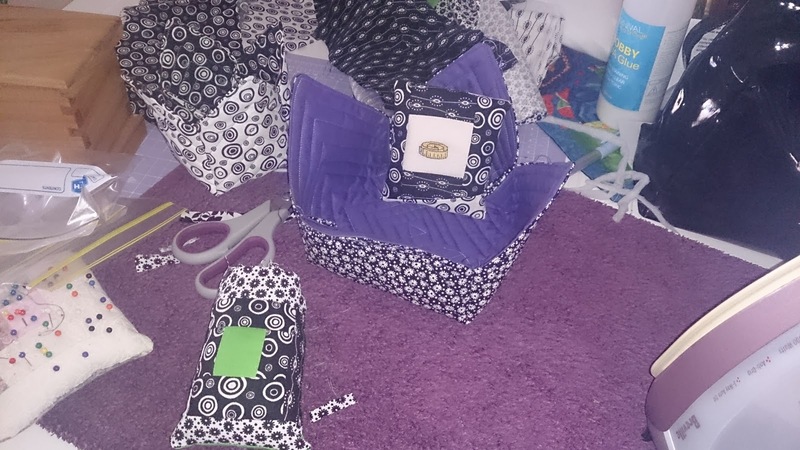 One is just the opposite black and white fabrics while the other is a black and white with purple to contrast. I should show some photos now I've talked enough. 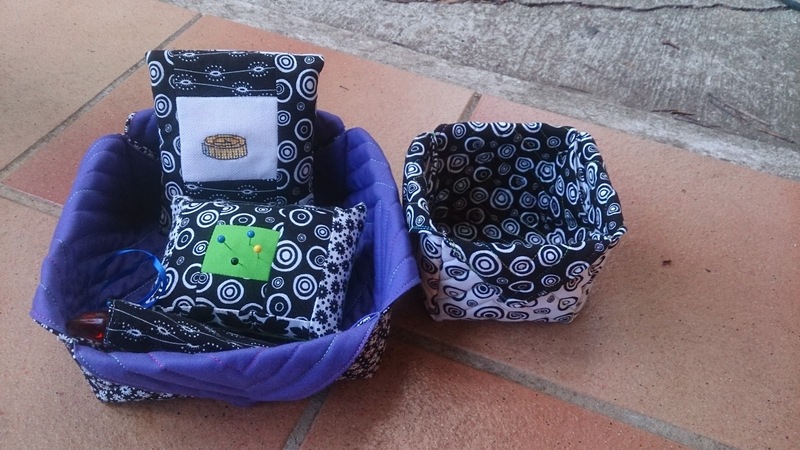 The two boxes and some other stuff I was coerced by my head into making. My table looked a little bit messy, I had the iron set up there as well as I needed to iron as I went. The only batting I seem to have is the iron on pellon. Though I like to use this as I don't have to worry as much about the fabric bunching. Box number 1 the 12 inch box. 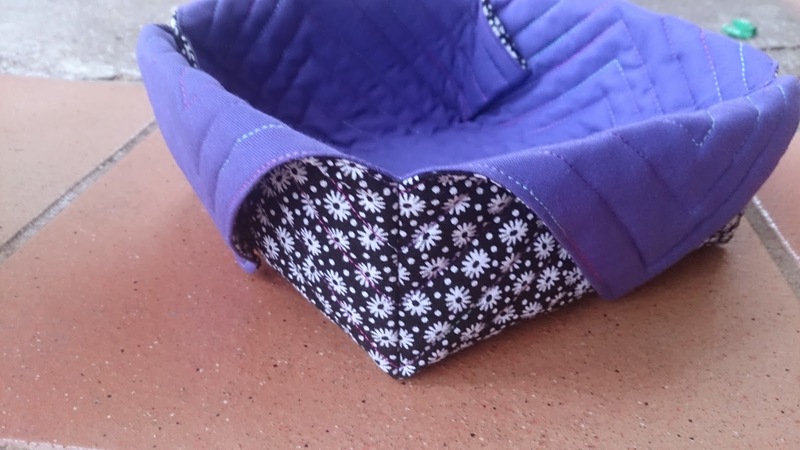 It is using a purple fabric and the black and white flowers. I used a multicoloured purple/bluey/red thread to quilt it so it was a statement. 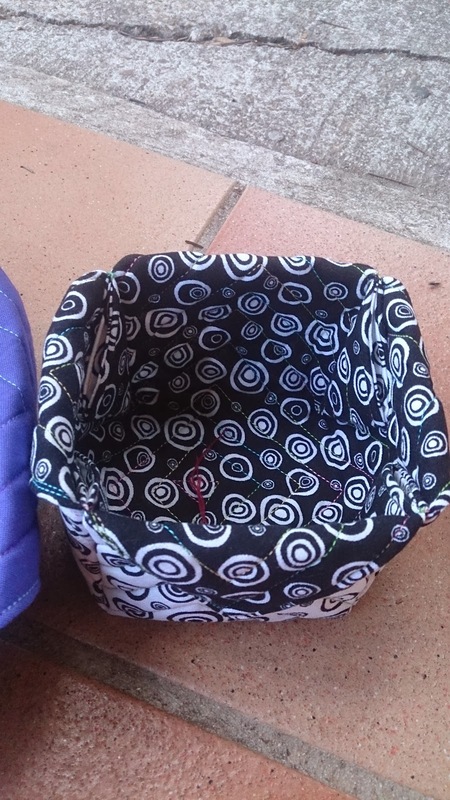 I only made it two inches deep so I'd have a wide shallow box for storing craft supplies. 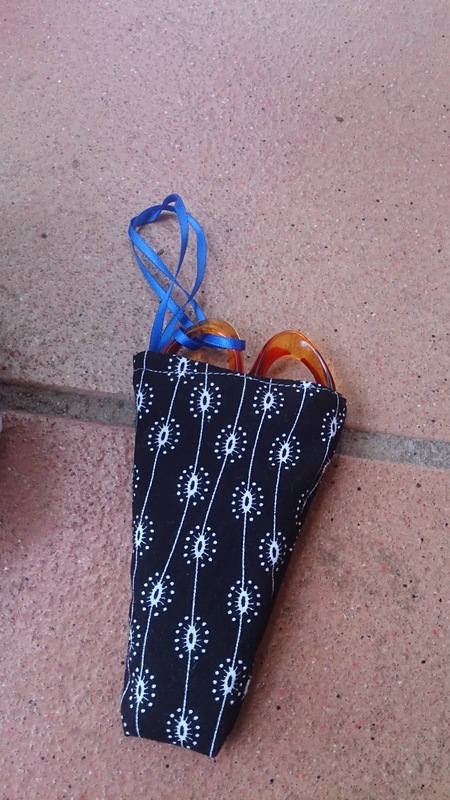 It is already in use with my tape measure, scissors and new pin cushion. More to come on that later. The second box is the black and white contrast one. 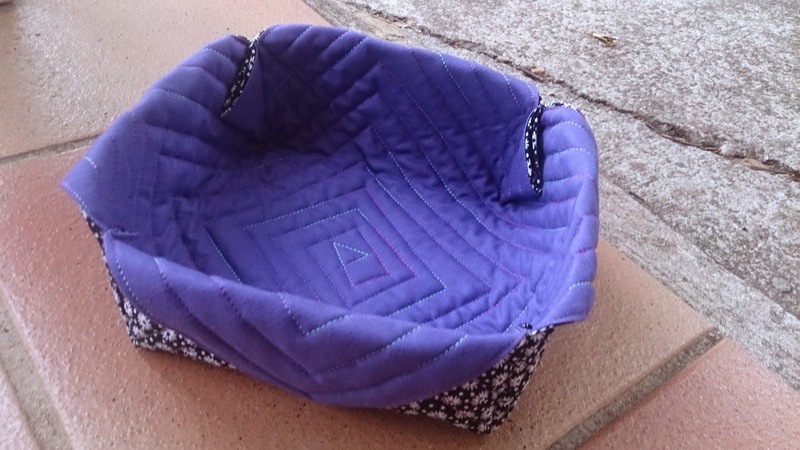 I quilted this one with a rainbow coloured thread. So it looks gorgeous against the black and white. I'm going to use this as an ORTs container for the foreseeable future until I find a better use for it. Now onto the stuff that after I finished the boxes I couldn't resist making. 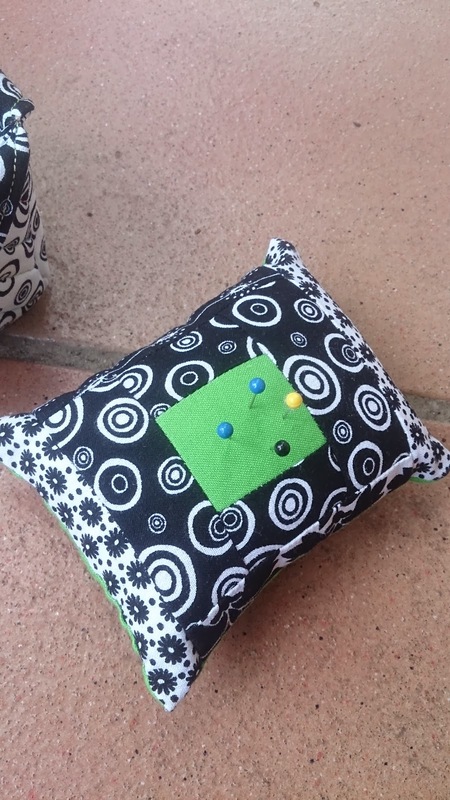 I have about 3 pincushions that I know of hanging around the house. But I just had to have one that matched the new sewing set it seemed I had to make. I also wanted a case to hold my scissors so that they don't cut open my new kit. I think I need to fiddle though because I don't quite like the design and I wanted to incorporate my stitching but because I'm not happy it will wait until I like the design. All together in their special home. They look so pretty! See I'm already using it for orts, but I've got to get back into the habit of keeping them again instead of just throwing them on the floor. I got a bit lazy with all the moving. So with all my wonderful work yesterday I actually have a lot to show though really not much stitching. I hope to have a stitching update soon but I just want to have a decent amount to show everyone then I can post it. At the moment it's not really worth it. Thank you for the link. I'm bookmarking that for sure. 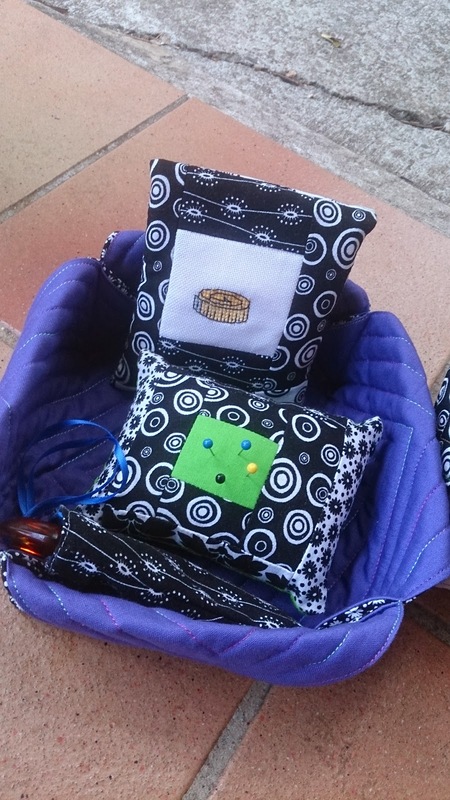 Love all your sewing projects Caitlin. what a beautiful set !! They look amazing! You are really creative and talented! The quilted boxes are adorable. I saved the pattern a couple of months ago but not my fingers are itching to start one :) Thanks for the inspiration.